Under Contract: $729,999 — Unit 1003 1 bedroom, 1 bath, 858 Sq.Ft. Stunning views of D.C. from this 10th floor 1 bedroom 1 bath stunner. 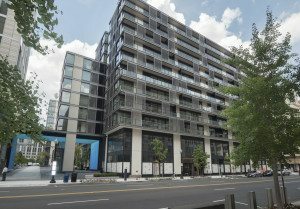 With its gourmet kitchen, hardwood floors, floor-to-ceiling windows, walk-in closet, and more, #1003 went under contract after 109 Days-On-Market. The price was $60,000 under the ask. Sold: $725,000 — #703 1 bedroom, 1.5 bath, 908 Sq,Ft. Originally listed at $699,999, Unit #703 was put under contract on the same day after a brief bidding war. This customized condo provides an open layout overlooking the courtyard, master bedroom with custom built-ins and lots of light, away from city traffic.